As the two Russian pilots descended by parachute after the Su-24 jet was downed, both were shot dead by Turkmen forces, Reuters reports citing a deputy commander of a Turkmen brigade in Syria. “Both of the pilots were dead on retrieval. Our comrades opened fire into the air and they died in the air,” Alpaslan Celik, a deputy commander of a Syrian Turkmen brigade said. He was speaking near the Syrian village of Yamadi, according to Reuters. Celik held what he said was a piece of a pilot’s parachute. A graphic video posted earlier on social media purported to show a Russian pilot lying on the ground surrounded by a group of men praising Allah. The men reportedly regretted they hadn’t burned him on the spot. The video was sent by a rebel group operating in the northwestern area of Syria, where groups including the Free Syrian Army are active but Islamic State has no known presence. Jahed Ahmad, a representative of the 10th Brigade in the Coast, the rebel group that attacked the pilots, told AP that at least one of the Russian pilots was dead upon landing. 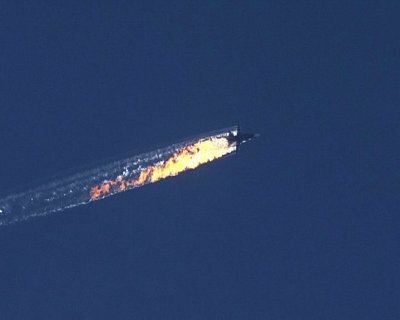 A Russian Su-24 bomber was shot down by Turkish fighter jets near the Turkish-Syrian border on Tuesday. Turkey said it was rightfully acting to defend its sovereignty as the warplane had violated its airspace and hadn’t responded to warnings. Moscow has denied Turkey’s claims, saying its plane was downed in Syrian airspace, where Russia is conducting an air operation against Islamic State and other terrorists. Vladimir Putin called Ankara’s actions “a stab in the back delivered by accomplices of the terrorists,” adding that it will have severe consequences for relations between Russia and Turkey.